Do exactly what you would do for a regular photo. We know what works and what doesn’t and we’ll help you look your best from all angles. We’ll review the 3D photo together and if you’re not happy with it we’ll take another one. Within minutes you’ll have a rotating 3D photo to share on social media. Are the busts and figurines in color? They sure are! Full color, all colors. How many people can be scanned at once? We can scan up to 4 people together. Restrictions apply. Simply step in the booth, get scanned (takes about ¼ second), review the image (a picture set is available instantly, while the full 360 view takes 10-15 minutes to generate) and place your order. You may order additional copies from home. Do I have to stand still for a long time? No, it takes only about ¼ second. We are a mobile and flexible business. We have walk-in/pop-ups at various locations. Please check MemoriesIn3D.com for dates, times and location. We also come to events and fundraisers. 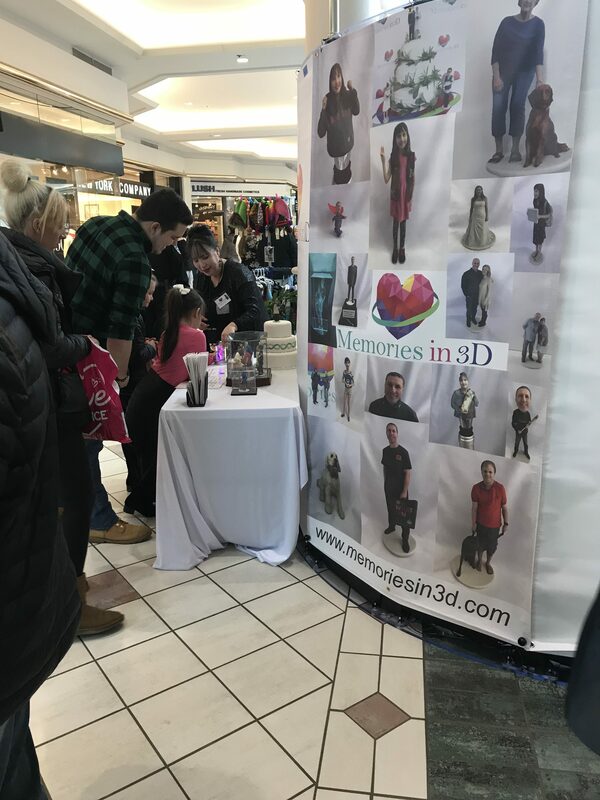 If the event is open to the public we announce that on our website (www.memoriesin3d.com) and advertise locally. We also offer “by appointment” service at our studio. Please call, email or click the “make appointment” on our website. Yes, we do! Call or email for details. When is your next walk-in event? Please check www.memoriesin3d.com for times and location. What’s the largest size you can print? industry. Don’t hesitate to ask. If it’s possible to do, we’ll do it. Do you offer other 3D products and services? We are very excited to unveil new 3D products and services soon. Please contact us for more information. The process from start to finish takes about 5-10 minutes. You’ll receive your rotating 3D photo in just a few minutes and your 3D printed product in 3 to 5 weeks. We scan people, pets and things. Is the lighting the equipment uses safe? Yes, the equipment uses only LED lighting. Can I wear whatever I want? We’ll help you look your best from all angles and you’ll love the result. We’ll look at the photos together to make sure you like what you see and what you get. Prices start at $49 for a small bust. Full body figurines start at $69 (prices include free shipping and tax). How do I order (first time)? Your order will be placed after you get your 3D Photo taken. What are the figurines made of? The figurines are made of hardened plaster (calcium sulfate hemihydrate). How do I keep my 3D print in the best shape? Keep your 3D prints in-doors at all times – never put your 3D prints in direct sunlight or under bright light! UV rays will fade your prints very quickly. Display or store you 3D prints securely. They are very fragile. Display or store your 3D prints between 50ºF and 75ºF. Display or store your 3D prints in a low-humidity environment, as moisture may damage the product (stains/fading). For transportation or longer term storage be sure to use bubble wrap and package your 3D prints in a box or container. These recommendations are also posted on our website.